Collecting Antique & Decorative Art Glass gives the professional or amateur glass collector access to some of the most beautiful items artists and designers have ever produced. Glass was actually accidentally discovered by the Phoenicians between 23 and 79 AD, and at a much later time Venice was the glass making center of the world. But glass making technology continually progresses and today the most collectible decorative art glass comes in many different styles and forms. Depression glass is an excellent collectible antique glass that remains popular because of its direct ties to U.S. history. Custard glass is a creamy opaque, opalescent glass that was extremely popular in the late 1800’s and the first few years of the 1900’s. It is highly collectible today. 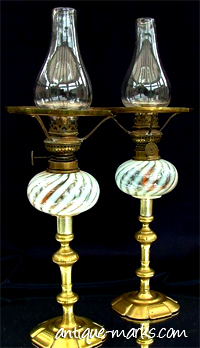 Carnival glass was popular in the very early 1900’s. It’s a pressed glass that has an iridescent rainbow sheen, and it too is highly collectible today. Other popular collectable glass includes antique Georgian glass, Art Deco glass and specific styles of art glass by good glass manufacturers and designers. Those dedicated antique & art glass collectors will often concentrate on a specific period or a specific designer.